Location, Location, Location!!! When only the best location will do. This Old Naples condo is one and half blocks to beach and walking distance to fine galleries, shopping and world class dining. Enjoy the new furnishings and look of this cozy property, new furnishings throughout, flat screen televisions, crown molding and much more, as of Fall of '09. All the comforts of home await you at the Fifth Avenue Beach Club. 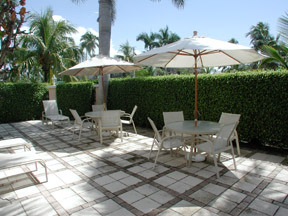 Come visit our little piece of paradise at an affordable price. It will not be your last visit! Now offering free WiFi service. Recent new additions include Egyptian cotton linens, new dishes, glassware and cutlery. Also new for Summer 2013 season new Tommy Bahama beach gear and a Bose Sound Dock for music while enjoying the condo. Saturday to Saturday rentals only for peak season, call for special requests. Please contact me with information regarding Fifth Avenue Beach Club 207.